Building this website consumes a lot of time. To take a break and do some model railroading I decided to do some kit building. I pulled a structure kit off the shelf and started working on it. Then it struck me that it might be instructive to other modelers and fun to chronicle my progress on the project. Besides, this offers an incentive to finish the model. 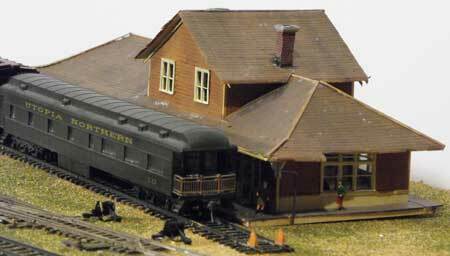 The kit is an HO station by Kanamodel Products. If you are an average modeler and have hesitated to tackle a craftsman-type building kit like ones from Campbell or Finescale, perhaps this will encourage you to give it a try. Station 9 is considered a "most difficult" craftsman kit. 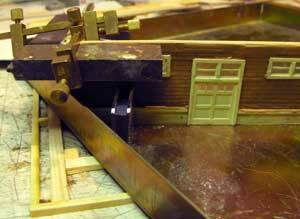 The station kit is made up of cardboard (chipboard), wood trim, paper shingles and metal castings. This #9 station is patterned after a standard Canadian Pacific (CPR) designed building used throughout the CP system. It is typical of medium-sized stations used across North America in the 20th century. 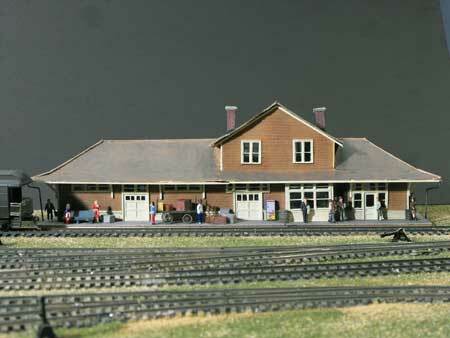 This specific model is based on the station in Port Moody, British Columbia. Port Moody was supposed to be the western terminus of the CP system but lost out to Vancouver when the railroad was extended further west to the coast. This station was built about 1908 and served into the 1970s when it was donated to the Port Moody Historical Society. The first thing I did was read the instructions to identify the parts and get an overview of the construction sequence and the paint colors that were used on the original. I normally use depot olive as a trim color for my Utopia Northern Railroad. In this instance I decided to stick more closely with the CP paint scheme. I'll come back to that later. The first step was to construct the base and foundation. For this kit I used a single-edge razor blade, a #11 X-Acto knife, a Northwest Shortline Chopper, and various metal squares and weights. I trued up the foundation with a metal square and built it in a metal frame using magnets to hold parts in place. I bought the metal frame from MicroMark. Before proceeding I used some fine sandpaper to remove any burrs from the wood strips and a sanding block to square up the ends where they abut each other. The instructions call for splice pieces at the joints in order to make the full length of the foundation. 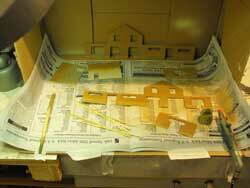 I used yellow carpenter's glue to join the wood pieces applied with a toothpick. My process is to cover my working surface with a piece of waxed paper and put a glob of glue on the paper. Then I use a toothpick to transfer glue to the wood. In this way I have better control over the amount of glue that is being applied. I did not paint the base yet. Whenever paint is to be applied to wood, the wood should be painted first because glue will interfere with paint coverage. I am less concerned about the base because it will be covered. Tip: Note that stripwood in kits is often color-coded. Cut from the end that is not colored so that you retain visual identification of the size of the wood strips. This is more important in the smaller sizes where it is easy to mix them up. I now have a rough idea of the building's footprint without the platforms by the track. 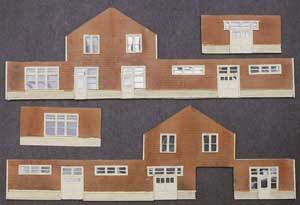 The minimum amount of real estate needed is 13 1/4 inches by 5 inches or approximately 94 X 36 feet in HO scale. Assembly of the cardboard walls. After identifying the parts by letter as recommended by the kit designer, it turned out that I appeared to be missing part of the walls. I contacted the manufacturer only to find out that the kit had been sitting on my shelf for too long! The kit had been redesigned and Kanamodel had no parts for the original kit. Fortunately, I never throw out leftover parts and cardboard from other projects and was able to scrounge together enough cardboard to complete the walls. I glued together the side wall for which I had all the pieces and then used that side to figure out how to cut pieces of cardboard to make out the part I was missing. I glued everything together on top of the waxed paper with the yellow glue using an NMRA metal ruler as a straightedge to keep the long sides aligned. Then I put all the pieces under heavy metal weights to keep them from warping while they dried overnight. My FastTracks metal jigs came in handy for this. After the walls were put together it was time to clean up all the metal castings for doors and windows. These castings had a lot of flash so it took awhile to get them all smoothed. I keep a set of needle files for metal and a separate group for working on plastic. After cleaning off the flash I test fit all the windows and doors. I had to do a lot of trimming of the cardboard. For this I used a new single-edge razor blade, a new X-Acto blade, and an emery board from my wife's makeup kit. An emery board can be cut and shaped to get into corners where it is hard to use a sanding block. In the process I realized that, even though I had read the instructions, I had flipped the front wall the wrong way and none of the doors would fit correctly. I had to dig around for some more cardboard and rebuild the front of the wall. Not the end of the world. If you're new to this don't let errors throw you off. Mistakes can be covered up and you'll get better the more you try. At this point the kit instructions call for shingling the upper portions of the walls. My procedure is to cut a bunch of strips to the approximate length of where they will be needed and make sure they extend beyond the ends of the walls and window openings. You can use a soft bristle brush to apply water to the strips, but I still find it faster and easier to use my tongue to wet them. Apply them with a slight overlap and use the point of an X-Acto blade to move them into position. I line them up by sight. Sometimes it helps to draw in spaced lines as a guide. I didn't do that here. After drying the walls under weights I went back and trimmed the shingles at the edges with the razor blade. I did a second test fit of the castings before moving on. The walls painted and shingled. Before going further I decided to paint the shingles and the wood trim. The CP painted their stations with a rusty brown color and the trim a creamy white. First I sanded all the trim by sanding away from myself. Don't pull the sandpaper along the wood towards you because the strips will bend and break. I used Polly Scale Aged White for the trim, applied with a brush. For a faded appearance I put the paint on an old handkerchief and pull the strips through my fingers. This works well with stain, too. The instructions suggested spray painting the shingled walls. I normally hand paint shingles so this was a departure for me. I put on my respirator, opened the door and window, set up my temporary spray booth with newspaper and waxed paper, and misted the walls with Polly Scale Earth. I didn't particularly like the result so I resprayed with a light, uneven coat of Polly Scale Rust. Do what looks best to you. Next I taped down waxed paper in my temporary cardboard box spray booth and tacked the metal castings to pieces of masking tape, sticky side up. This will hold the castings in place while spraying. I then changed to Aged White in the airbrush cup thinned about 25% with water. It took a couple of light coats to get the coverage I wanted. Using the waxed paper made it easy to rotate the work so I could spray from all sides. Finally, I took extra care to clean all parts of my Aztek airbrush so it will work the next time I need it. Never skip this step. The backs of the castings for the roof brackets will need to be painted after the front sides dry. I still wasn't happy with the wall color so after everything was dry I went back over the shingles with a soft bristle brush and a light coat of a few drops of India Ink in a jar of 70% isopropyl alcohol. The jar is a baby food jar I've used for thirty years. Never throw anything away! When dry I laid on some light coats of black and burnt sienna powdered chalks. I put everything under weights because the India ink mixture might warp the cardboard. The next step was to add the bracing and trim to the walls, put acetate window panes onto the castings, and install them into the walls. I use the point of an X-Acto blade and an NMRA metal ruler to mark and cut the acetate. Adding a layer of masking tape to the back of the ruler will help to keep it from slipping while cutting. I also find that cutting the acetate on a sheet of waxed paper makes it easier to see the marks and to find the acetate. Acetate pieces can easily become lost in the clutter. Put them down for a moment and they disappear. The kit instructions warned against using ACC glue to install the acetate. ACC will cloud the acetate. The kit instructions were to use contact cement. I've always used Walthers Goo. It's a little messy and you need to be careful squeezing it out of the tube. It reacts quickly to air. I usually use the Goo full strength. I find the best way to spread it is with a toothpick or pin. It can be thinned with acetone. Acetone is brutal on the lungs. Work in a well-ventilated area and wear a respirator. If you want to thin it, invert a small liquor measurer and mix the acetone and Goo on the slightly concave surface using a toothpick. The bay window will be built and installed after the walls are together, squared up and the bottom of the walls are leveled. The left end wall and front squared up and glued. This phase lasted more than a week. The instructions said to make sure all the walls fit correctly and then to begin gluing and squaring them in a specific sequence. I didn't have enough hands or clamps to hold everything in alignment at one time so I departed from the instructions and took a different approach. The station is too long to fit inside the metal frame that would allow me to use magnets to hold pieces in alignment. The same walls viewed from another perspective. However, I could make the first right angle for the left end wall and front if I placed the walls inside the frame diagonally. 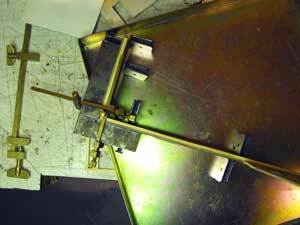 Here's what I did, using a machinist's metal square as an extra check. Here's a closeup view of the clamping. From here I proceeded to add the right end wall, the inside dormer walls, and finally the back wall to the left end end wall. The dormer walls gave me the most trouble because of my earlier error. The extra thickness of wall material on the rear wall had to be carefully cut away to get the pieces to fit.I added extra bracing in all the corners and from back to front to retard warping. This is one of the biggest differences in construction from styrene although I've found it's a good idea with plastic buildings to keep them welded together and to keep light from escaping through the seams. Then the whole wall assembly was glued to the foundation with white glue. The bay window in the front wall is assembled after the main walls are glued in place. This took some time to get all the pieces to fit correctly. I assembled them in the metal frame using ACC cement to glue the metal pieces to the wood trim and cardstock and then to the front wall. I decided that I would not build an interior but I would light the inside of the building. Before beginning work on the roof I painted all the inside walls and the floors with Polly Scale Roof Brown. This will keep the unfinished white from showing. I may add diagonal view blocks from black card. I'll decide this after I have the lights working. This is a view from slightly higher looking down into the shell. The walls have been assembled and squared. I decided not to build an interior but to add lighting. In the past I have just used micro bulbs. This time I installed Faller lighting sockets with 16 volt, 50 mA screw-in bulbs (Article Nr. 180670). I attached them with 00-80 bolts and nuts through the floors. One went into the main room behind the bay window. I added a floor in the freight area to the left and installed the second bulb there. I will add a micro bulb in the waiting area before gluing on the roof. Next, per the instructions, I made and installed the rafters that support the main roof.The roof is precut as two pieces of cardboard that need to be spliced together. After being glued and dried, I proceeded to shingle the main roof. Campbell shingles installed on main roof sections. The first step is to rule in lines as guides for the shingles. If you ever need to glue down Campbell shingles, the lines should be ruled 3/32" apart. Due to the length of this roof I used an 18" metal ruler to draw the lines. Shingling is a tedious task that can't be rushed. You want to keep the lines straight. It took me about three hours to shingle the roof. I started each piece at a gutter and cut the first shingle to match the roof pitch, then marked the other end and cut it before gluing it in place. This differs from the walls where you can run the shingles past the edge and trim later. Here you want to minimize trimming in the gutters. Tip: I have found it easier to keep the roll of shingles in the plastic package they come in and only cut off one corner. Then I simply pull out the length I need for each strip. This keeps the shingles from becoming tangled. Finishing and installing the roof was the most difficult part of building this kit. The first problem I encountered was that the roof would not fit. It was too short lengthwise. This may have been due to shrinkage of the cardboard because the kit sat on my shelf for too long. I solved the problem as best I could by adding some trim strips under the eaves. Although the problem would not have been apparent unless someone picked up the model and studied it, I was more concerned about light leakage through the seams. I also decided to glue the dormer roof in place instead of trying to make it removable. Hopefully the lamp inside doesn't burn out! 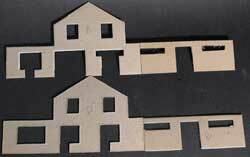 The problem is that cardstock has a tendency to warp especially when adding shingles or painting. I kept the pieces under weights after shingling but even so there was a curl that was difficult to straighten. Because the edges of the dormer roof are straight it was easier to extend the shingles beyond the ends and then trim with scissors to get a straight edge. I didn't realize until I glued the dormer roof sections in place that I had forgotten to cut out the shingles where the chimneys had to go. I used an X-Acto knife to poke through the roof and cut out the shingles covering the holes. After painting the roof with washes of Polly Scale earth, roof brown, and grimy black, I draped weights on the roof using anything I could get to stay in place on the slopes. Even so, I had some curling. This made it very difficult to get the outside edge trim pieces to adhere along the entire length. If this were to be entered as a contest model I would lose quite a few points. The next step was to cut and install the platforms around the building. First I weathered the wood with Hunterline's Weathering Mix. This is an alcohol-based wood stain. The wood still curled even though I put the stain on both sides of the wood. I glued it down with white glue. To keep it flat I used my heaviest files on the long platforms and some shorter weights along the ends. Uncut weights for rolling stock come in handy for this. The next step was to install the chimneys. The upper story floor acts as a stop for the bottom of the chimneys when installed with a length of square stripwood underneath the casting. Then I used a trick I learned in a Finescale Miniatures kit. I mixed up some 5-minute epoxy and added a few drops of grimy black. I applied this with a toothpick around the base of the chimneys to represent tar and to hold the chimneys in place. Lastly, I installed drain pipes at the ends of the front roof. After struggling to keep them in position with ACC glue I gave up and resorted to my old faithful, Walthers Goo. The kit came with a few crates and cans as details and a kit for a baggage cart. After building the cart I decided to add some other details to make the scene more alive and to divert attention from my mistakes.I didn't givethe chimney glue time to dry. When I came back in the morning it had leaned to one side. This was the most noticeable error that needed attention. Details make a big difference, especially people. I scrounged around in my miscellaneous box and came up with a bunch of stuff. The completed station waiting for maintenance to fix the chimney. Well, it's done. I learned a lot and have the satisfaction of completing construction of a kit I had procrastinated about for long enough. The manufacturer was correct. This is a difficult model to build. However, you don't get better unless you try. Here's the final result. As my mother-in-law would say, "Far from perfect, but perfect from far!" lastly, a view of the finished kit temporarily installed on my former Utopia Northern RR on the freemo module, Utopia East. It will find a new home on my UNRR being rebuilt. I hope my humble efforts encore you to try craftsman-type kit building. The completed station with the leaning chimney corrected. Return from "kit-building" to my Home Page.